There’s several theories behind the well-known children’s rhyme. One links it with a supposed attack on a bridge by a Viking king in the 11th century. Another, rather grim tale, suggests that children were buried – perhaps alive – under the foundations of an early bridge. So strong was this tale in people’s minds that it was even tested by archaeological digs, although no bones were ever found. But most people tend to go with the tale of Queen Eleanor, who was given the right to take tolls on the “Old” London Bridge by her husband, Henry III, as a present. Which was great for her as she suddenly had lots of cash coming in. It was less so for the bridge, for all the money was simply spent by Eleanor, and none was spent on routine repairs and maintenance, causing the structure to deteriorate. The bridge that Eleanor was given responsibility for was a far different structure to the rather plain 1970s structure that exists today. Building work began on the medieval bridge back in 1176, and wasn’t completed until 1209. Nowadays bridges tend to be rather functional affairs, simply used to get from one side to the other. But not so for the mediaeval London Bridge which became home to hundreds of shops, inns, living accommodation and even a chapel, until it was finally decided to replace it some 600 years later. Eleanor lost her right to levy tolls on the bridge in 1284 when the bridge was passed over to the City of London. The Bridge House Estates charitable trust was formed to take responsibility of the bridge and – preferably – keep it in a good state of repair; a duty it continues to do to this very day. 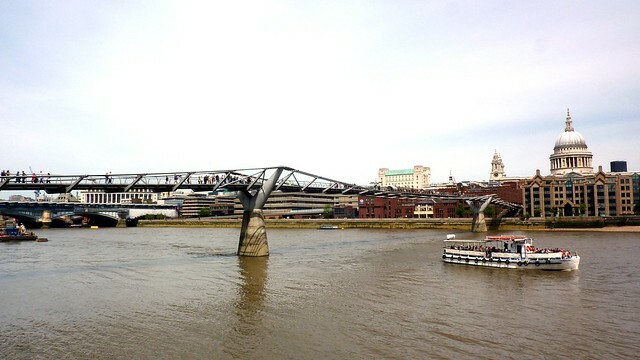 As well as London Bridge, it also owns Southwark and Blackfriars bridges, the Millennium Bridge and the mighty Tower Bridge, with all repairs and maintenance funded by an extensive property portfolio. So much property did the Bridge House Estates amass, that it now has a significant surplus of money which is given to local charities. It was to be a day of bridges on the Thames Path. Three of Bridge House Estate’s other bridges would be passed, along with plenty of other road and railway bridges too. And it would be a day of tourists too, as the Thames Path took us through what must be the most used stretches of all National Trails. Tourists. People in London either love them or hate them. And on a sunny Sunday at the end of May, there were certainly plenty around as we set off once more from London Bridge. London was especially full of German football supporters who, the previous day, had been at Wembley watching FC Bayern München beat Borussia Dortmund 2-1 to win the 2013 UEFA European Cup. As well as the football fans, Clink Street seemed to have also attracted the attention of a time traveller. As we stood next to the replica of Sir Francis Drake’s flagship, the Golden Hinde, a mysterious figure in a cream-coloured frock coat, red and white striped trousers and a stick of celery attached to his lapel, suddenly appeared, snapped a picture of the boat, and headed off up Clink Street. There were clearly few fans of Doctor Who around, at least fans who could remember Peter Davison portraying the Fifth Doctor anyway. And that’s not something you can usually say about most other National Trails. You’ll be hard pushed to find a Tom Baker lookalike dressed in a frock coat, long multi-coloured scarf and fedora wandering around the Pennine Way. We caught up again with our Fifth Doctor outside the Clink Prison Museum, listening to a tour guide explain the history of the notorious former prison which was based on the site until it burned down in 1780. There was no sign of a TARDIS anywhere, and the poor Doctor seemed to have resorted to carrying his possessions in a black rucksack instead. 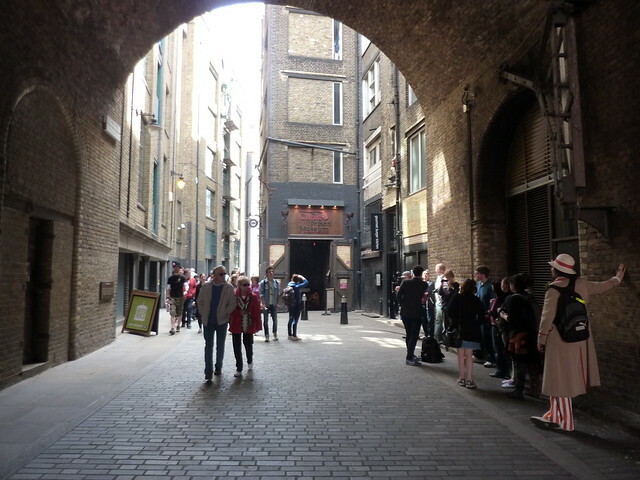 Close by to the Clink is another famous London landmark; the Anchor Pub on Bankside. The pub was first built in 1615, and was where Samuel Pepys watched the Great Fire of London as it tore through the city. It later became home to vagabonds, river pirates and smugglers, although today it will be best known to tourists for serving fish and chips. Over the years it’s grown and been extended, and in 2008 had what is reputedly the most expensive pub refurbishment ever, costing a whopping £2.8m. It’s not the only expensive venue on Bankside. As we made our way through the crowds, we arrived outside Shakespeare’s Globe – a £30m rebuild of the original Globe Theatre, which opened in 1997. Of course Shakespeare never wrote any of those plays you know. He was a commoner so could never have had the intelligence. They were all obviously written by Edward de Vere, 17th Earl of Oxford. It’s just so clear. de Vere was in the aristocracy, so obviously had the brain power. Only people with titles can write plays you know. A short way up sat a giant building with a large tower. For years this was Bankside Power Station, which generated electricity for the capital until being deemed surplus to requirements. That wasn’t the end for this imposing building, and it received a makeover so audacious that most expected it to fail. At a cost of £134m, it was converted into an award winning home for modern art, Tate Modern. At the time many believed there were nowhere near enough potential visitors to justify the cost, but they were quickly proved wrong and five million people make their way through its doors every year. So busy is the gallery it was decided to spend £215m on an extension which would double the gallery’s floor space; work which was busily progressing as we passed by. The extension work meant that the Turbine Hall – by far Tate Modern’s best known exhibition space – was closed but we took a detour into one of the exhibition spaces to see a small exhibition on urban ruins. Pride of place next to the door was a piece which featured a radio receiver on a turntable, rotating round and emitting a frankly annoying, ear screeching repetitive sound. “Don’t you get a headache, listening to this all day?” Catherine asked the attendant on duty. It was hard to disagree. About the only person there not to bat an eyelid was my son who simply gazed around without a care. What he thought of the racket, he didn’t reveal. As we left, I recalled how I once saw Una Stubbs sat on a bench outside Tate Modern. This is a rather pointless anecdote that adds little to the overall story of Thames Path walking, but I felt the need to share anyhow. Diversions due to building work isn’t something that the average National Trail walker has to contend with. However as previously noted, the Thames Path isn’t quite like any other National Trail. As it meanders through the largest urban conurbation in the country, it’s almost inevitable that the trail’s going to suffer. One prime example could be found just beyond Tate Modern. 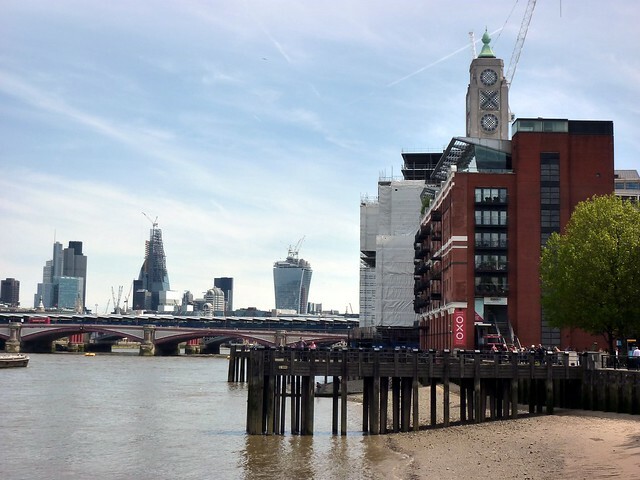 For several years, rebuilding work at Blackfriars railway station meant that the Thames Path had been shunted on a tedious diversion down a successive series of rather dull backstreets. So bad was the diversion that the owners of the nearby Founders Arms pub had suffered two years of poor trading as the closures had meant that no one had been walking past their establishment. Only with the main path re-opening had things got better, and the pub’s outdoor terrace was filled with people supping pints and enjoying their lunches as we passed by. 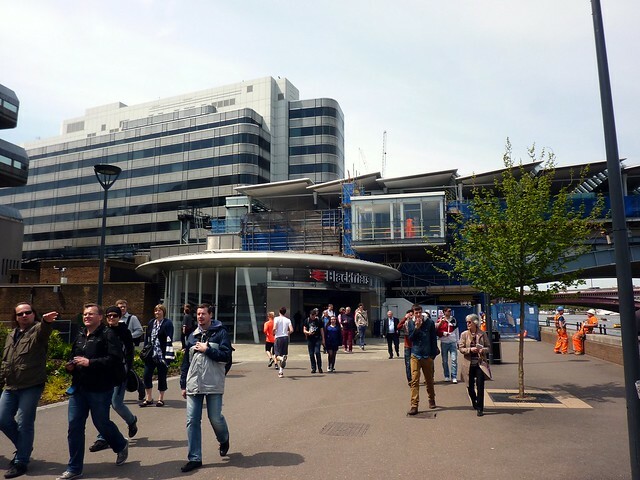 Originally with its entrance on the north bank, rebuilding work at Blackfriars Station had seen the station recently become the first railway station to straddle the Thames, when a second entrance was opened on the South Bank. Should they wish, those with a train ticket could now walk from one side of the river to the other, rather than making the effort of going a whole two minutes down the road to cross via Blackfrairs road bridge instead. Oh yes, and they could catch a train somewhere glamorous. Brighton, Luton or Sevenoaks or something. There didn’t seem to be many people heading to the platforms as we passed. The station building was merely being used by most as a cut through; the proper Thames Path route being temporarily closed for some more station building work, and the crowds had been diverted through the station’s ticket hall instead. The few people heading up to the platforms had to battle their way past the endless stream of cyclists, pushchairs and German tourists with football scarves. And on the other side stands a giant crest of the London, Chatham and Dover railway, builders of the original Blackfriars Railway Bridge. The crest is perhaps one of my favourite things in London for the ostentatiousness of it, and for the fact that it sits at the end of a bridge that no longer exists. The original bridge had been replaced for passenger services in 1885, which moved to the current, neighbouring bridge. By the 1980s the original was in poor condition and the bridge was dismantled, leaving just a series of red painted columns standing in the water. The crest and the pillars certainly outlasted the London, Chatham and Dover railway. Founded in 1859, the company pooled its operations with the rival South Eastern Railway from 1899, before both were merged into the new Southern Railway in 1923. 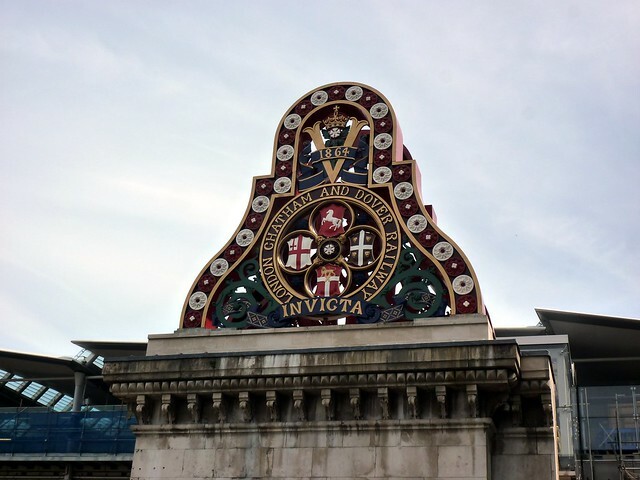 The London, Chatham and Dover railway name remained on the sides of trains for just forty years, but at Blackfriars the company’s insignia remains to this day. Well, except for a brief break in March 2011 when the two 16 tonne cartouches were removed for cleaning and repair, before returning a year later. “It’s a bit like being a tourist in your own city,” said Catherine as we gazed at the variety of sights on the route. We’d both walked this section of the path many times before, but it was impossible to get bored of it. There were just too much to see and admire. I may have lived in London for fourteen years, but I never fail to enjoy the sights of the South Bank. How could you? It’s just wonderful. Iconic view, after iconic view. Stunning architecture. Mighty buildings. And a river at the heart of it all. One of those mighty buildings would be passed now. The OXO Tower is another London landmark, with its geometrically arranged windows that just so happens to spell out the name of a famous brand of stock cubes (an clever way of getting around a ban on illuminated adverts on their building.) And opposite the OXO Tower on the other side of the river, an equally fabulous building: the Portland stone clad neoclassical Somerset House where Nelson’s brother once worked. For many years its elegant courtyard was a car park for the Inland Revenue staff who worked in the building, before being converted to a public space in the late 1990s. We strolled on, pushing through the crowds as the riverside path heaved and groaned under the number of visitors. Towering above us was the 22 story high London Studios tower, home to ITV. I’d once had a job interview there, and had to force myself not to constantly gaze out of the window at the rather grand view. National Theatre followed and then the Southbank Centre; their various network of buildings and walkways a testament to the architect’s love of concrete in the 1950s and 60s. Large halls, galleries and massive walkways filled all the space. Yet, unlike many examples of the era, the whole thing seems to actually work. As we poked around the outside of the Royal Festival Hall, I pondered the original architect’s models for the area, and feeling that for once, the model probably reflected reality. 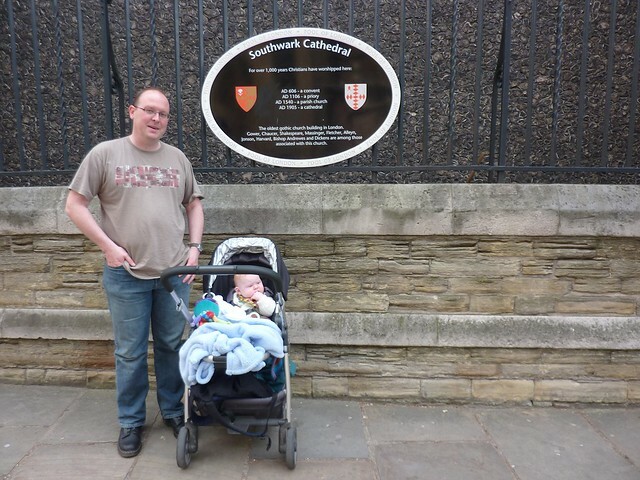 Sam on the other hand was missing it all, being as he was, almost inevitably, fast asleep in his buggy. We popped round the back of the Royal Festival Hall to find some lunch from the weekend food market, before heading inside to deal with the inevitable nappy change that marks one of the many challenges of walking with a small child. 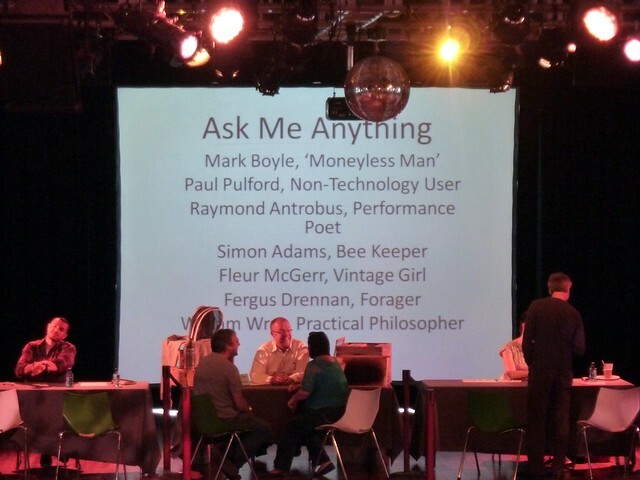 On a stage in Hall was an “Ask Me Anything” session, with desks set up so the public could go and chat to “Vintage Girl”, the “Moneyless Man” or an expert on bees. Sitting at a table with a cup of tea, we mused once more about how the Thames Path provides facilities that you’ll find on no other walking trail. Baby changing facilities, the ability to grill a performance poet and a choice of lunch from several different stalls selling different types of curries, all on one walking trail? Who needed hills when there are steps? And ramps for those with wheelchairs or buggies, of course. For good measure I hoisted Sam onto my shoulders for the first time in his life and showed him round, before realising just what pressure a small child could place on me. Refreshed and revived after a whole mile and a half of walking, we headed on towards the London Eye, to battle our way through the even greater crowds. 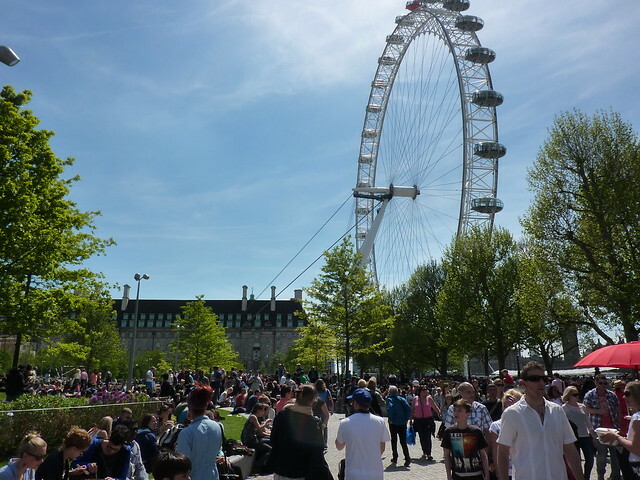 Next to the capital’s giant observation wheel, punters queued up outside food stalls and relaxed on the grass in the sun, whilst we weaved our way slowly but surely towards County Hall and its additional range of tourist attractions. Aquariums, dungeons, a video games arcade and, oh look, a branch of McDonalds! As the pavement narrowed, the crowds jostled for space and our slow speed was reduced even further as we joined the throng of people making their way towards Westminster Bridge. The Thames Path headed under the bridge, and then was suddenly empty. Almost all the tourists had automatically headed up onto the bridge itself, no doubt on their way to visit the imposing gothic building that is the Houses of Parliament. Which was ironic really given one of the best views of the UK’s seat of government is, without a doubt, from the near deserted riverside path we were now stood on. 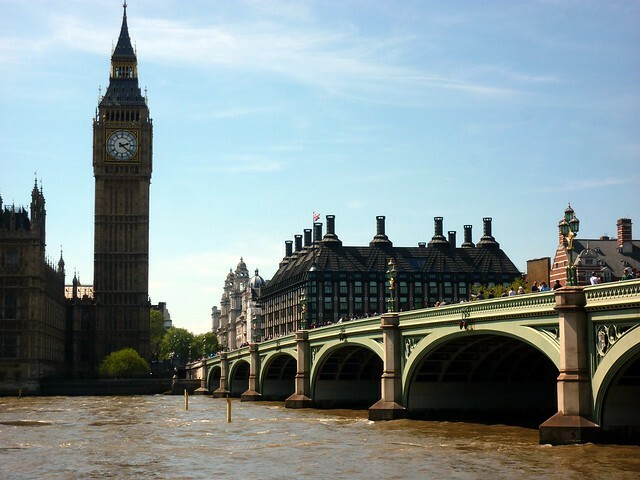 There it was, across the river, one of Britain’s most famous landmarks, with its 61m high clock tower that everyone mistakenly calls Big Ben (which is the name of the bell), but which any true Londoner calls the Clock Tower. Well it was, until some MPs decided it should be called the Elizabeth Tower to celebrate Queen Elizabeth II being on the throne for sixty years. The sycophants. Several years earlier, I’d been on a guided tour of the UK’s parliament building during the summer recess. We were shown the lobbies and the green seats of the House of Commons. It looked so small. But what I found more remarkable was how few British people there were on the tour. Almost everyone was from overseas. I idly wondered how many people who lived in London had ever been in that building, and suspected it wasn’t many. The tour didn’t take in the Clock Tower, although its 334 steps can be climbed by UK residents upon application to their MP. Although if I ever did it, there was no way I was lugging a buggy up them all. 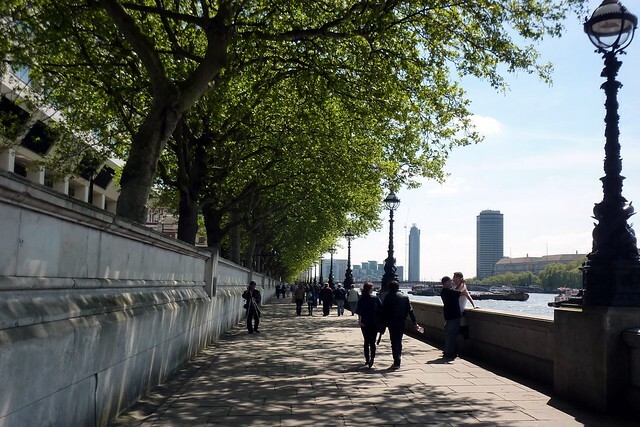 Between Westminster and Vauxhall bridges the Thames Path follows the Albert Embankment, built by engineer Sir Joseph Bazalgette in the 1860s. Bazalgette was one of the greatest engineers of his day, designing a number of iconic buildings and bridges in the city, as well as helping to create London’s sewer system. His great-great-grandson, incidentally, is Peter Bazalgette, one of the people who helped popularise TV show Big Brother. With the crowds now gone, joggers and cyclists were now free to take over, which they did with gusto. And with the Thames Path’s brief dalliance with tourism was almost done. The views became more mundane, with the large Millbank Tower dominating much of the view. Tate Britain, sister gallery to the imposing Tate Modern we’d passed earlier, was across on the other side, hidden by trees. And up ahead a building came into view that had a more intriguing function. The green tinted windows of the SIS Building at Vauxhall Cross houses the spies and spooks of the Secret Intelligence Service, commonly known as MI6, who moved in in 1994. But most wonderfully of all, right next to this building where so much secrecy goes on, was also the start of a major London tourist attraction: the Duck Tours. For a shade over twenty pounds each, you too could set off on an amphibious vehicle along roads and river from the same seat. And the whole journey set off from a small slipway right next to those green windows. Several launch together in rapid succession, racing down the river from the slipway, churning the water as they went on. 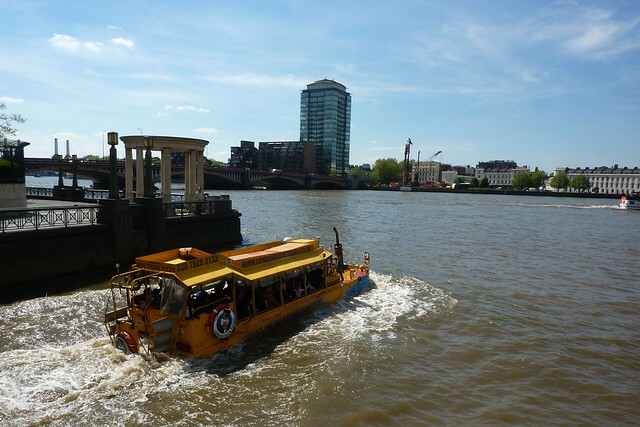 For those tourists, their journey had begun but as we reached Vauxhall Bridge it was time for us to leave the trail. Our three mile stint may not have been very long, however transport considerations meant it was a convenient place to call it a day and head home. Pushing the buggy up the ramp to the main road, we headed towards Vauxhall tube station and left the river glistening in the sun. Next time: a strange tour guide, flats, oh so many empty flats, a terrible cafe in a lovely park, bridges galore. First Published: 27 November 2013. Last Updated: 19 August 2015.